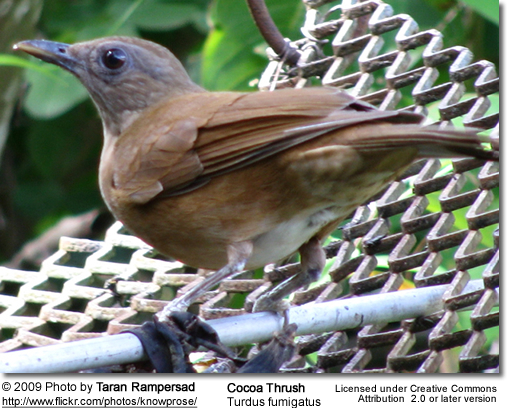 The Cocoa Thrush, Turdus fumigatus, is found in South America from eastern Colombia south and east to central and eastern Brazil, and on Trinidad and some of the Lesser Antilles. Its habitat is dense forest. 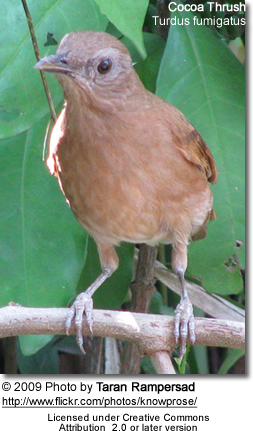 The Cocoa Thrush is 22-24 cm long. It is dark rufous brown above and paler rufous brown below. There are five poorly defined races, differing mainly in the brightness of the plumage. Males and females look similar, but young birds are duller, having the scalloped underparts common in immature thrushes. Generally a shy species, but on Trinidad it appears to be much tamer, and is often seen visiting bird feeders. The nest is a lined bulky cup of twigs low in a tree or treefern. The average clutch consists of two to three reddish-blotched greenish-blue eggs, which are incubated by the female for about 13 days to hatching. The young fledge about 13-15 days after hatching. They feeds on or near the ground on insects, especially ants, other invertebrates and some berries. Its song is a musical warble. It also produces a variety of typical thrush chuck and chak calls.